Mother Daughter Portraits from Photographs - No-Risk Guarantee! "Own a unique, exclusive work of art, created by a specialised artist from your own favourite photograph..."
One of our team of specialised artists will create the finest quality, exclusive, hand-painted oil painting from your own favourite mother daughter photograph, on fine quality European linen canvas. A beautiful gift for the mother daughter themselves, or an equally treasured gift for husbands, parents, grandparents or other family members. Your favourite mother daughter photograph can be recreated in vibrant oils in a wide range of sizes to suit your individual requirements and budget. Just compare the prices below with the cost of commissioning an artist to paint mother daughter portraits in their studio. It would probably cost you thousands of pounds and mean enduring countless 'sittings' before you could receive your portrait. Your oil painting will be created entirely by hand by a very experienced artist, without automation of any kind, from your own simple photograph. They can even combine two different photographs into one portrait if you don't have a single favourite photograph that includes both subjects! Size / Type 12" x 16"
These prices are for oil paintings against a plain background. 'Head-and-shoulders' and single subject portraits start at just £95 (US$160). See our 'Paintings from Photographs' general 'Price Guide' here. Price includes VAT in the UK and free delivery worldwide. US$ prices are approximate and depend on the exchange rate. Frame not included. An oil painting makes a very special, unique gift and imagine the joy of receiving a fine oil painting of loved ones. 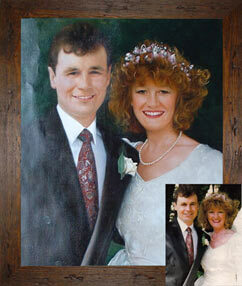 Why not transform your favourite photograph into your very own work of art? A priceless gift to cherish forever! You can buy them a Filman Fine Art Gift Voucher here and let them choose their favourite photograph for themselves! This makes a perfect gift for any occasion.